Improvements – Property has numerous shooting towers with feeders located throughout the tract. Good interior road system. 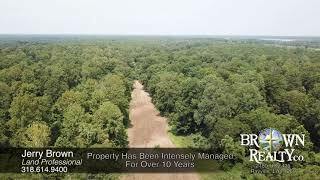 Comments – This Warren County, Mississippi property offers some of the best hunting opportunities anywhere along the MS River. The property is accessed through Madison Parish, LA behind the MS River Levee. The deer herd is phenomenal and has been managed intensely for over 10 years. The owner harvested a true 12 point 2 yrs ago that green scored 186". The buck numbers here are incredible. There are numerous hunting blinds & feed stations located throughout the property. The owners personal blind is a custom built 12&apos; x 12&apos; high rise stand with shooting benches overlooking 200 plus acres of food planted for the wildlife. Deer counts commonly exceed 100 head on any given afternoon. If quality gets your attention, you must see this property.